The backhoe is one of the most commonly seen pieces of construction equipment because of its adaptability. Its cousin, the front-end loader, is also a smaller piece of equipment that has a broad bucket like the one on the front of the backhoe for hauling soil, debris, and materials, and lifting them up into trucks. These two machines have some much larger relatives, including the road grader (with a large blade that smoothes soil surfaces), roller compactor (equipped with a heavy roller that compacts soil and asphalt during construction), the bulldozer and crawler tractor (big loaders that move earth by digging, ripping, and blading, with traction from rolling tracks, not tires), the excavator (a track-mounted vehicle with a much larger bucket than the backhoe), and the scraper (with a large bowl in the center of the machine that cuts into the earth and carries the material it has cut in that bowl). More distant members of the vast construction equipment family are cranes, dump trucks, pipe layers, draglines, truck-mounted drills, and shovels. The key to the power of the backhoe is hydraulic pressure. Hydraulic lines, a reservoir of hydraulic fluid, a pump, and a series of pistons allow the machine's operator to extend its arm and cut through soil with a toothed bucket. The pump exerts pressure on the hydraulic fluid, and operating the levers opens a valve that releases the oil into a piston. The piston expands to lift the arm, swing the bucket, press the bucket into the soil, and lift it out of the excavation. Reversing the valve causes the oil to flow out of the piston and return to the reservoir. The backhoe's standard equipment is a narrow bucket on the rear end and a loader on the front. The operator effectively makes either device the working end by simply rotating his chair and operating a different set of controls. Typically, if the bucket is being used, the flat front end of the loader is set down on the ground to stabilize the vehicle. The history of heavy excavating machinery began in 1835 when the dipper shovel was invented to excavate hard soil and rock and to load trucks. The dipper shovel was steam-powered and mounted on rails like a train. Rail lines were laid into mines and large excavations so the dipper shovel could move around and load materials into railroad cars or horse-drawn trucks. The dipper shovel had a short boom (lifting arm), a dipper stick (a beam that pivoted out from the boom and gave the shovel its name), and an attached bucket for digging. 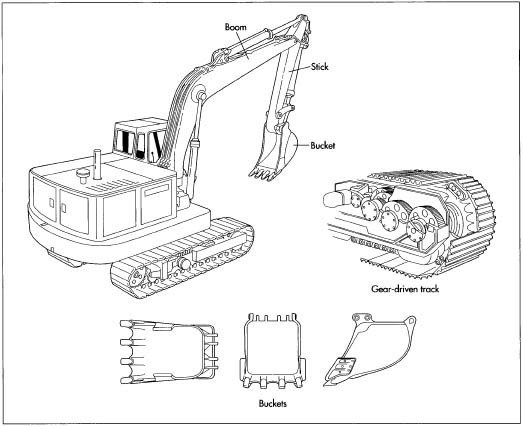 The dipper shovel was modified in many ways to create the familiar construction equipment of today; the boom was changed, different attachments were added, the weight and balance of the equipment were changed, and the type of tires or tracks were chosen to suit the equipment's primary jobs. Of course, with the invention of gasoline-and diesel-powered vehicles, construction equipment became even more adaptable. Most construction equipment is powered by diesel engines, although electric-power, battery power, and propane tanks are used on specialized equipment. A backhoe with highlights of its gear-driven track and bucket. placement of utilities. Backhoes and trenchers are used to excavate trenches for drainage and utilities. But, from the early 1900s until the late 1950s, the backhoe remained a large piece of equipment, and agricultural tractors were often called into service for smaller, limited access construction projects. Kits were available to adapt the tractors to construction tasks, but sometimes the right connections or attachment points were not provided, and the strains of construction were unsafe for the tractor's design and the operator. In the late 1950s, a boom in residential development sparked another spurt of changes in backhoe design. Excavation of footings for house foundations, trenching, backfilling (replacing soil in a trench to cover drainpipes or utilities), and grading projects required a compact machine capable of a variety of tasks. By 1957, Elton Long, an engineer who had retired from the Case Corporation, reinvented the backhoe in the form of the loader/backhoe that combined two pieces of equipment in one and allowed the agricultural tractor to return to farming. Long's loader/backhoe had rubber tires for mobility and the right swing mechanism and buckets for specialized work. The loader on the opposite end of the machine from the backhoe bucket provided weight and balance when the backhoe was used; likewise, the teeth of the backhoe bucket could be driven into to the ground to provide anchorage as the loader lifted heavy materials. By 1965, other evolutions of the backhoe had created machines exclusively for the construction industry; diesel power, improved hydraulic linkages, four-wheel drive, and other features were added or improved in the 30 years from 1965 to 1995. By 1995, Case added its L Series loader/backhoes to its product line. The six models in this series have improved hydraulics, more comfortable cabins for the operators, fuel-injection pumps, better cooling efficiency, better access for servicing, improved road performance, improved cycle times (allowing the operator to shift the transmission and accomplish the full cycle of lowering, digging, and raising the bucket), larger fuel tanks, and increased performance of both the backhoe and loader. They range in power from 73 to 99 horsepower (54 to 74 kW), and their loaders are able to lift from about 5,300-7,300 lb (2,400-3,300 kg). The backhoe on the largest L Series machine can excavate to a depth of almost 16 ft (5 m), and the Extendahoe (an adapter that increases the length of the stick) increases that to about 20 ft (6 m). Backhoe manufacturers purchase many of its parts as subassemblies, or partially assembled smaller units, that the manufacturer then completes. The manufacture of subassemblies may be done by a number of independent firms that specialize in metal fabrication, hydraulics, or other specialties. The subassemblies that are commonly purchased by backhoe builders include the chassis (body), drive line (the engine, transmission, and front and rear axles), and the loader and the backhoe (the buckets themselves plus the boom, stick, and other attachments). The hydraulic system is supplied as a package including the pump, valves, and hydraulic cylinders. The operator's station may be an open, canopy type or an enclosed cab; these may also be provided by outside suppliers. Raw materials purchased by the manufacturer and included in many of the subassemblies includes medium-strength alloy steel in the form of thin sheets and as thicker plates that are about 1 in (2.5 cm) thick. The thicker steel plates are used for structural parts of the backhoe, and the thin steel is for housings and cosmetics. Plastics comprise the trim in the interior and around the exterior of the cab, and a temperature-resistant composite plastic is used for the air-cleaner housing. Seals are made of a high-grade elastomeric plastic that can withstand high temperatures and pressures. A lower grade of plastic is formed into the fender and the cab trim. A subcontracted foundry uses ductile iron to cast the backhoe and loader buckets. By late in the twentieth century, the function, and so the basic design, of the backhoe was clearly defined by the construction industry that uses it. Design improvements continue to be made, but they are in features and performance characteristics, rather than radical design changes. Leading manufacturers like Case Corporation rely on surveys among their customers to collect data leading to design modifications. The company defines the product based on a list of attributes, and these attributes are ranked in importance and in actual performance or delivery by the customers. Case routinely surveys its customers globally to obtain data over the broadest range of operating conditions; it hopes to learn that the design concepts behind its backhoe exceed their customers' expectations. After collecting survey results and opinions from its customers, Case uses a technique called Quality Function Deployment (QFD) to boil down the input and create a new model or series of models with the requested characteristics. Three or four prototypes of the new design are built, and customers are invited to visit the manufacturing plant for "customer clinics," during which the proto-types are examined and tested. Construction operations are simulated over two or three days, and the customers evaluate the performance of the prototypes and the new features. For example, the operator's comfort may be evaluated in a series of as many as 50 questions and a kind of competition between the earlier design and the prototype. With this detailed input, the manufacturer then performs its own durability, reliability, and other tests and analyzes cost and manufacturability of the redesigned product. Further internal quality evaluations are done before the product is actually launched in the marketplace. 1 Manufacturing begins at the receiving docks of the factory. Purchased sub-assemblies and components are unloaded, inventoried, and stored at a number of docks and then directed toward subassembly cells. These cells are a number of work areas where components and subassemblies are put together in more complete units or sub-assemblies. 2 For example, the components of a canopy-type cab will go to one cell where the steel canopy components are cleaned of oil. One side of the canopy is tack-welded together by a robotic welder and then final welded. While the robot welds, the subassembly operator loads the components for the other side. It is welded in two steps, and the parts of the canopy are welded together, also in a tack and final weld. The completed canopy shell is then loaded on a conveyor to carry it to the next operation. 3 The backhoe casting (poured by an independent foundry) has not been machined. In a subassembly cell, it is machined in a flexible machining center that is computer controlled. Bushings (the bearings that are required at pivot points) are fitted to the machined casting, and the backhoe subassembly is fed through the painting center to the next assembly area. Similarly, the loader arn components are machined, equipped with fittings, and moved through the painting center. 4 The material handling system consists of conveyors that are both electrically powered and free to move as subassemblies are placed on them or removed. As the structural subassemblies are completed, all are conveyed through the painting center, which has two processes. The pieces are primed using an electrical deposition process that provides a generous protective paint layer. This is called an "e-coat" for the electrical method and is also termed a robust process for its vigorousness. The final coat of paint is applied manually because the painters are able to observe where paint is needed and use their judgment in applying it; that is, manual painting is more flexible than the electrical process. The painted subassemblies are conveyed to curing ovens where the metal is heated to cure the paint. 5A parallel subassembly is the cylinder factory. The cylinder rods are usually received in precut lengths that have already been internally machined and chromed. Fittings are added in a subassembly area, and the cylinders are processed through their own dedicated paint system where they are e-coated, hand-painted, and oven-cured. The completed cylinders are carried by forklift to the assembly area. The radiator is also a finished assembly, but connections are added so that water lines may be attached to the radiator and, from it, to the engine. Other subassemblies for the cooling, fuel, and lubrication systems are fumished with appropriate connections, attached lines, and sometimes, pumps and valves. Larger components like cylinders and tanks for fluids are added later during the assembly of larger components. 6 All of the subassemblies meet each other in the assembly area. The subassemblies are transported to and delivered at the point-of-use on the assembly line, so there is no lost motion for the assemblers. Each chassis is set on its on assembly cart with its front and rear axles and built up from the deck (bottom or base) to the cab. The cab and canopy are assembled at another area; when each unit is finished, it is carried to the chassis assembly line and attached to the completed chassis. 7 The engine, radiator, transmission, and hydraulic system are mounted onto the chassis. Other systems like the fuel, coolant, and exhaust components are also mounted on the chassis. Hoses and other fittings are attached, and supporting flanges or brackets are added as appropriate. When the cab is in place, the controls are linked to the engine, hydraulics (for moving the buckets), and other systems controlled by the operator. The two buckets—the backhoe and the loader—are the last of the large components to be put in place, using large pins that fit the inset lugs and bushings. Their hydraulics are fitted, tightened, and tested. 8 The electrical system is the last to be connected; all of the fluid-bearing systems are attached and tested first. Batteries, electrical connections for lighted controls in the cab, and lighting are hooked up. Final body rails and handles are bolted in place, and trim is added. 9 Although all the major parts were pre-painted in the subassembly stage, the finished backhoe makes a last visit to the paint booth for a final coat. Detailing is the last step; decals and warning labels are applied to specific locations based on a template, and each completed backhoe is driven off the assembly line on its own power to the testing area for evaluation. Quality begins outside the backhoe factory with each of the subcontracted suppliers. They are given product specifications as well as lists of key or critical characteristics (end results) that might not be immediately obvious from the specifications. The suppliers perform their own quality inspections and certify their products with data from those inspections. As the components are received, they begin a history of documentation, called station control documentation, that travels with them through each stage of manufacture. First, they are logged in and inspected at the receiving dock, then the assemblers inspect them to make sure they meet the specified criteria at each stage of assembly. Each assembler on the line has the authority to reject parts or subassemblies throughout the process. A welder may reject parts for fit or rust, and an assembler can stop the entire assembly line if he or she sees a flaw in materials, subassembly, or appearance. Independent of the assembly line, the manufacturer also performs random audits. Inspectors may look at components, entire systems, or subassemblies and pull them off the line for inspection. The purposes of these audits are to check the items against specifications, confirm the observations of the assemblers, train assemblers in the finer points of inspections, and maintain the high standards established by the manufacturer. A final check is performed on each backhoe. The inspector uses a checklist to validate a set of criteria for the machine's function; for example, there should not be any leaks, torque levels should be appropriate to the pieces, and moving parts should move according to a set of clearly defined motions and limits of motion. Backhoe manufacturers do not produce true byproducts, but they make lines with several different models (called derivatives) and accessories. The derivatives are not identical, but they may have a number of features in common to keep costs down and to ease the manufacturing process. The derivatives or models may differ in size, scale, horsepower, or engine displacement. Case's current line of backhoes includes a model that is a loader only. With a three-point hitch and landscaping tools that are manufactured as a separate set of accessories, the loader becomes a loader/landscaper, and its uses are multiplied. The process for manufacturing backhoes produces little if any waste. Scrap is not generated in the assembly process. In accordance with directives formulated by the U.S. Environmental Protection Agency (EPA) for clean air, paint systems are carefully regulated so they produce little airborne waste. An internal wastewater treatment system treats water that is used to clean materials, product parts, manufacturing equipment, and the factory itself. This internal system discharges into the local city wastewater system, so an external monitor confirms that there are no contaminants in the discharged water. Other materials—principally card-board packaging and wooden pallets—are reusable or can be recycled. Safety is a primary concern in the factory. Assembly processes are designed to be ergonomic (that is, they allow workers to move without stress or strain), lifting is limited, and safe work zones are built into the assembly line. Overall, the industry establishes and rewards safe work practices, and, through training, workers are constantly made aware of safe work issues. A major manufacturer should have millions of worker hours without any safety-related losses. Despite the backhoe's well-established position in the construction industry, there is always room for improvement. Design modifications are driven by customer demand. As of 2000, the two primary areas where customers would like to see more improvements are in the ease of operation and the operator's comfort. The need for simple operation is forced by the fact that there are fewer skilled operators in the marketplace. And operations and reliability are both improving because of the continuing integration of electronics, automation, better engine technology, and on-board diagnostics. It is now up to the manufacturers to cost-effectively incorporate improvements. The future of the backhoe depends not only on cost-effective design changes but cost consciousness in all aspects of operation including maintenance, durability, fuel efficiency, and resale value. The backhoe is its own best guarantee of a secure future. It is a versatile machine that is becoming even more flexible, thanks to modern technology linked with a proven track record. Adkins, Jan. Heavy Equipment. New York: Charles Scribner's Sons, 1980. Nichols, Herbert L., Jr. Moving the Earth: The Workbook of Excavation. Greenwich, CT: North Castle Books, 1976. Singh, Jagman. Heavy Construction: Planning Equipment and Methods. Rotterdam, The Netherlands: A. A. Balkema, 1993. Case Corporation. http://www.casecorp.com . (December 14,2000).